1. Hello Travis, welcome to Kick Acts. Tell us a little about yourself. Sure, I’m currently a student at ISU studying the most random mix of disciplines, theater and geology. Music is my first love however. I started playing in high school and actually started out on the drums and later moved to guitar and other instruments. These days I play out two or three times a week and give lessons on drums and guitar. When I’m not playing or studying, I’m outside. I’m always hiking, kayaking, camping, or down with whatever the boys are doing that weekend. 2. The “tree song” is a catchy tune. What was the inspiration for that one? A couple of years ago I got very interested in the art of story telling. A good friend of mine, who is a professional story teller, really started to rub off on me. I loved watching how he could keep the attention of an audience with the use of different characters and doing things as simple as changing the pitch of your voice. The art of it just seems magical to me. My style has always been that of the story and when I started getting influenced by this style specifically, I decided that I wanted to push the story telling genre in my own music and thus the cautionary tale of a boy that climbed too high. 3. If you had to pick your # 1 song writer or story teller of all time, who would it be and why? Paul Simon has always stuck with me through all of my musical phases. His music has been a strong influence for me. This is a man that has had an amazing musical journey that spans and connects so many generations and a great role-model for someone like me that is putting around with my own musical career. 4. Where can we find you on the web and do you have any CD’s out? 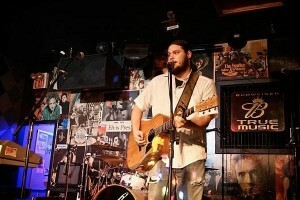 You can find me on facebook and myspace of course and soon on reverbnation.com. As far as having CD’s out, I usually just make my own in my room and give them out for free at shows or to friends. I love to record a few songs that I’ve recently written throw a CD together and hand it out to anybody that will listen. I am currently in the studio recording my first “official” solo album that is tentatively set to be released in August of this year. 5. We ask everyone this question and it always brings out some cool answers. Worst gig of all time? That is a great question! I’ve done shows that have had bar fights, drug deals, racial outbursts, fires, and so on. But, the worst gig of all time, my band was playing in this little run down bar outside of Terre Haute. The night was going good until we had a request for a slow song, which we did. No big deal, right? Wrong! When we started to play, a very run down 60+ year-old woman came up with her mullet-toting son and thus began a 4-minute long sexual, grinding session that sent the band into a series of laughing/crying/gagging. A gig with incestuous overtones just takes the cake. 6. Best gig of all time? Best gig…I would have to say was a frat party I played last year. It was an end of the year beach party which I played solo with my acoustic. I was skeptical about it because a frat party didn’t seem like the place for a singer-songwriter but this was by far the most responsive crowd I had ever played for. I actually led a sing-a-long that was so loud the cops came! I made some lasting friends in the fraternity and they’re actually bringing me back for more parties which I’m very much looking forward too. 7. Are you familiar with folk singers like Joni Mitchell, Joan Baez, Harry Chapin, John Denver, Bobby Gentry or OZZY (LOL)? If so, what are your opinions of them? I am familiar with them and have high opinion of them all. Nothing says “solid folk singer” like biting the head off a bat! I love the genre and all the artists in it. I don’t think any other genre of music contains quite so much variety in sound and subject matter. 8. Ever been to Haight Ashbury? If so, what was it like? If you haven’t been,why not? Have I ever been? Maybe…I have no clue what that is. You caught me, I am not hip. 9. So, according to your Myspace page, you’ve been in college far longer than you should have been. What’s up with that and what is the best way to prepare mac & cheese? I can’t stop learning. I started out as a theater student and after taking many additional classes in music and anthropology, I started my second degree in Geology which I’m nearly finished with. It’s a vicious cycle because I feel there are many other things I will end up studying! As for the mac and cheese, I wouldn’t know. That’s high class college food and I’m on the ramen diet. 10. # 10 is called “Shout It Out Loud”. It’s were you get to talk about whatever you want to talk about. So go ahead Travis, and “SHOUT IT OUT LOUD”! STOP TEXTING AND DRIVING! FOR REAL PEOPLE! awesome interview! Can’t wait to see him perform again! I have had more fun at a dentist office than reading this stuff.